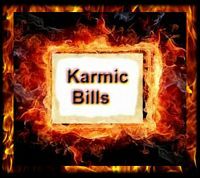 When karmic disease is imposed upon some from previous incarnations, such as cancer, those who have dragged their feet long enough away from spiritual laws, finally, as a karmic accelerator cancer comes into their life so that they can destroy a karmic bill of many incarnations to come in one single lifetime; therefore, even cancer is a blessing in disguise. Staunch vegetarians die of cancer because diet makes no difference. You can be in top physical shape; you can do nutrition, run, jog, and everything else and die of cancer just the same as retribution from previous incarnations. However the master tells us there will be a cure for cancer but sadly other diseases will take its place. Our health is not only biological but it is controlled by cosmic engineers, cosmic designers or astral forces which police the body cells. We are utterly ignorant of our own body functions. The conclusion is that nearly all diseases are psycho-somatic or thought induced. The time will come when psychiatrists and psychologists will gradually take the place of doctors. These illnesses are psycho-somatic thoughts influenced by the subconscious mind-field memory and by inharmonious flow of (pranic) energy currents in our thirty thousand billion cell batteries. In the United States Grand Canyon you have the Coral River that begins with all kinds of curves in this river; similarly, you are creating the same inharmonious flows in your own body. As a result, scoliosis of the spine may develop. Many have this deformed spine that is why we have millions of people going to chiropractors and osteopaths. We have one leg shorter than the other and trouble with our hips because the currents of energy are not flowing properly in our body, and as they begin to move in a certain way, they begin to disturb at every level the proper equilibrium of your inner structural body. Unless one goes to the root cause of the disease itself we cannot prevent its occurrence. What we need is a mind so attuned with the super-consciousness of the soul that it will transmit its boundless energy into the body cells and not only reprogram our cells but change the very chemical structure of our cells and gradually destroy the blueprints of disease which are locked up as memory banks in the computer of the subconscious mind. When a person transgresses physically, mentally or spiritually and the action of an individual becomes very bad, they generate inharmonious vibrations that attract disease germs; the agency of all evil and a portal is opened for a specific disease. Specific disease enters specific parts of the body because of specific thoughts. We have opened portals to specific diseases according to the nature of the transgression that enters the body. It is necessary to go to the very source of the disease. Stubborn mental or physical disease always has a deep root in the subconscious. Illness may be cured by pulling out its hidden roots. The vaccine to cure and kill these hidden roots is Scientific Healing Affirmations otherwise known as “psycho- immunity.” To develop such thoughts in the subconscious mind that one is automatically repulsed by anything which is violent, vile and foul to the point of dragging you down, one must not just resist it but one must not want anything to do with it. That is what we call “psycho-immunity.” Mental cure is superior to all methods of physical cure by using the power of your mind. It is superior to any other method you can use because imagination, will, faith and reason are states of consciousness that actually act from within. Therefore television conditions ones level of consciousness. If you do not reprogram your mind by daily affirmations, you will remain exactly where you are at for the rest of your life. From the teachings of PY.